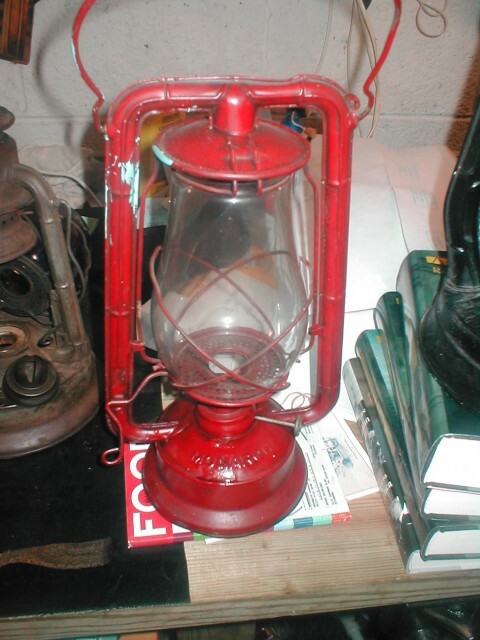 This site shows my collection of oil lanterns. 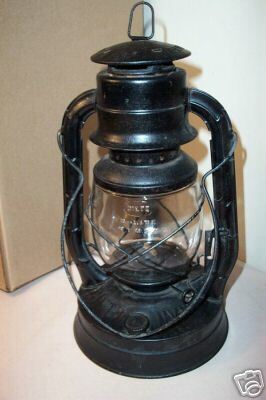 Dietz was the most popular U.S. lantern manufacturer from the 1880's through 1956, at which time the company moved from New York to Hong Kong. 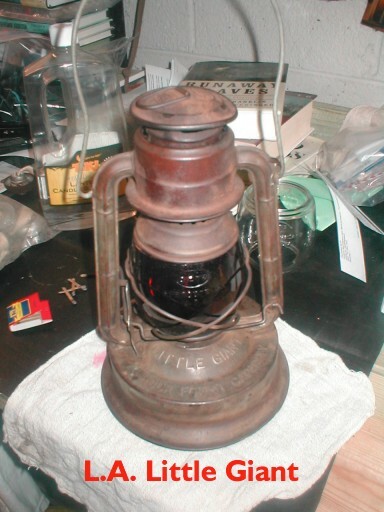 The pic below shows the jurisdiction which purchased this Dietz Little Giant Lantern. 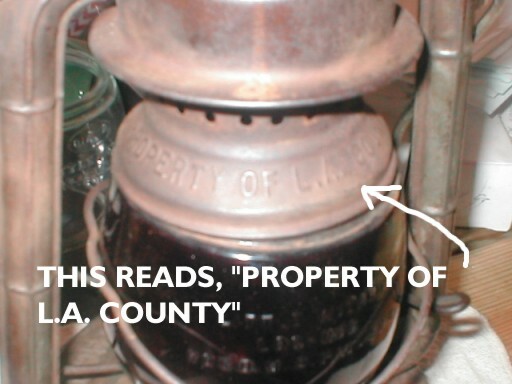 I have two Los Angeles County Roads lanterns. These were used for road hazards prior to the perfection of battery operated DOT flashing lights. 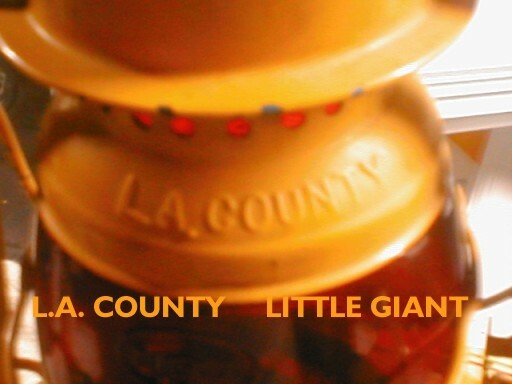 The Little Giants had a kerosene burning time of 70 hours, which worked well with transportation departments for road hazards. Notice the red globe. The one above, with a rising cone, is not as old as my other Little Giant pictured below. 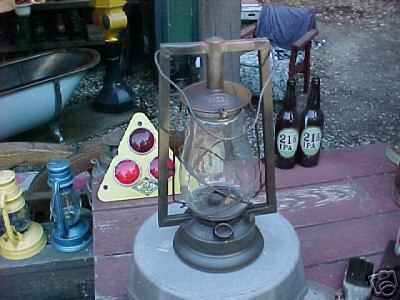 However, both lanterns were made before 1939. The Little Giants were streamlined after that year (see below). The yellow on the top of the chimney tells me it may have never been lit before. 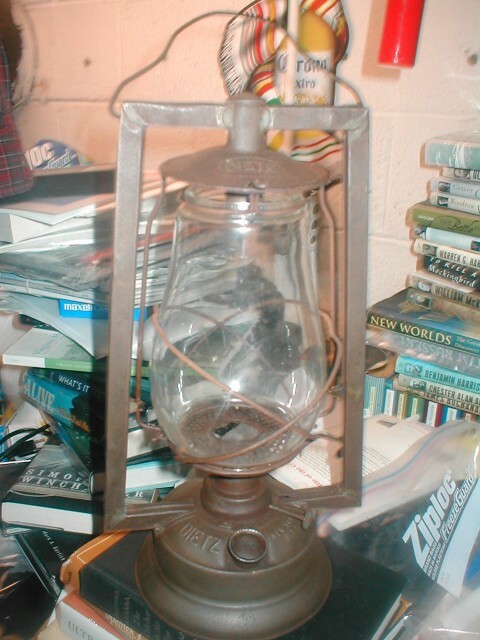 The LA lantern below has lost all of its paint and has obviously been used a lot over the years. It has the wing-lock cone. 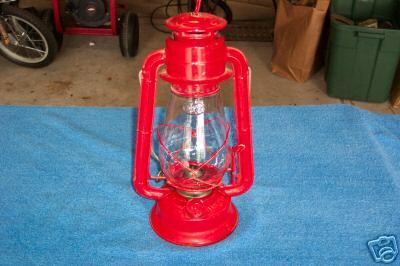 The Dietz Monarch is probably the most common type of lantern, at least the hot blast lanterns. A hot blast lantern works by the hot air rising into the tubes at the top of the globe. Then the air is forced dowward finally blowing back onto the flame. These lanterns are perhaps the best for indoor use due to, theoritically, less used air being emitted out from the lantern. These Monarchs had a rating of 4 candlepower. They were in production during the first half of the 1900's. This is an older version, probably from the 1920's. Beginning in 1936 they were streamlined. This means they had basically an extra curve in the vertical tubes pointing down towards the tank. This is a little more hard to find. This is called the number 25 Dietz. It is flat on one side allowing mounting to a wall. This is perhaps my oldest lantern. It is a Dietz Victor. My guess, judging from the square tubes and tank, is that is probably dated to around 1915. This is a Dietz D-Lite. This is the streamlined version. Streamlined lanterns are also called the Art Deco models. Notice the extra bend in the two vertical tubes towards the tank (fount). This is post 1936. The tank was shaped a little differently as well post 1936. This is pre 1956 because it was not made in Hong Kong. It says New York on it. 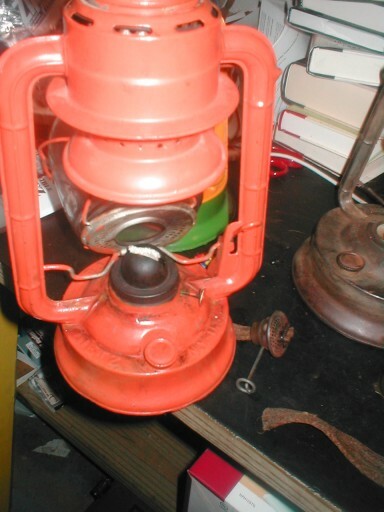 This orange lantern is a Dietz D-Lite. This is reported to have 30 candlepower. It is a cold air blast lantern, which means cool air is drafted onto the flame causing a brighter light. This one is not the streamlined version, which tells me it is pre 1936. 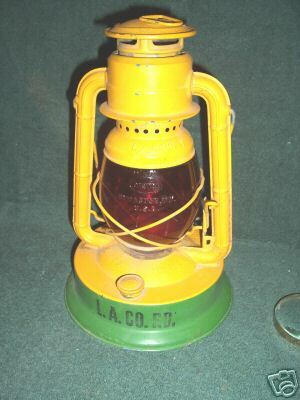 When manufactured, the D-Lite was the most expensive lantern Dietz made. Notice the cone. This is the part that is around the wick. This one shows a wing-lock cone. The burner (the part that is under the cone and raises the wick up and down, just sits in place under the locked cone. Wing-lock means the cone locks via two tabs that when twisted in the right spot, locks the tabs down. Some lanterns have rising cones which means the burner is locked down via a wing-lock and the cone goes up with the globe (glass) is lifted up. 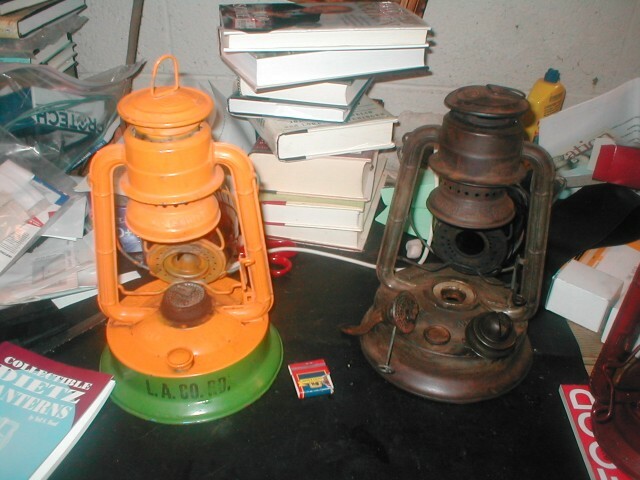 See the picture above showing both of my L.A. Little Giant lanterns. One has a wing-lock burner (rising cone) while the other has a wing-lock cone. This is a Deitz Junior. It was made in Hong Kong. So this was post 1956. It is not streamlined (confusing) because Dietz had to reuse the tooling from the lanterns of pre 1936 due to the wearing out of streamlined tooling. I believe all of these lanerns will have Hong Kong stamped under the tank. 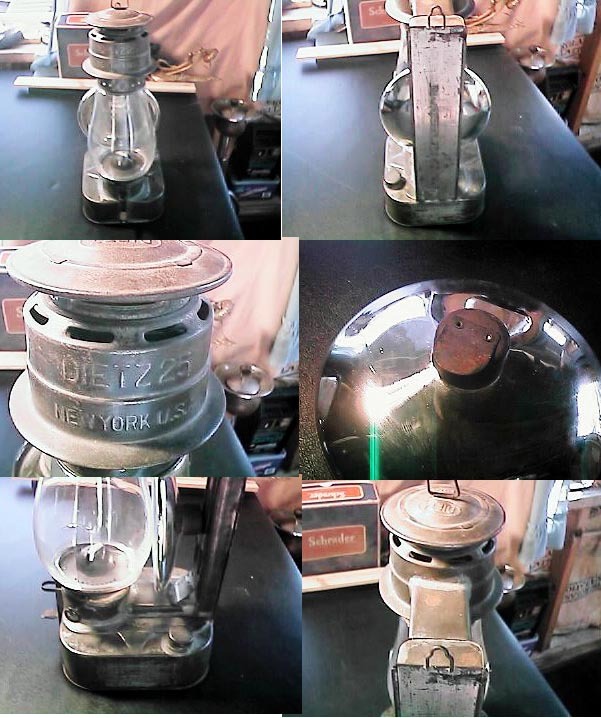 All pre streamlined lanterns will have Dietz NY or New York in some fashion stamped on them. If you have any insight on any of these lanterns, please inform me.